Pomegranates or “granadas” in Spanish are an ancient fruit, used before the Roman times. In fact, the city of "Granada" is named after the pomegranate! In the streets of Granada, there are pomegranate symbols everywhere you go. Around the Mediterranean, which includes the Middle East, pomegranates are a popular fruit to be eaten fresh or cooked in jellies, jams, desserts and sauces. This recipe is colorful and has a very festive look. Peel the cucumbers and cut into small pieces. Remove the seeds from the pomegranate. Pomegranates are very easy to de-seed in water and it only takes only 5 to 10 minutes. 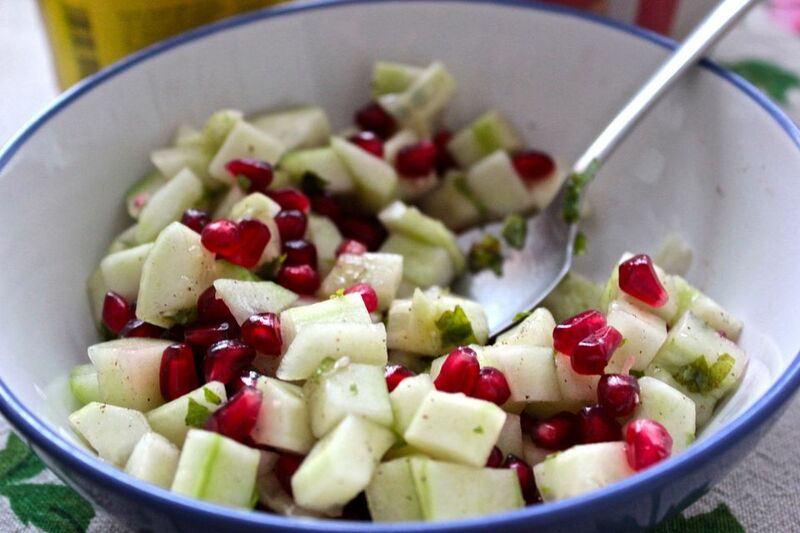 Place chopped cucumber and pomegranate seeds in a medium size serving bowl. Drain the garbanzo beans and add to the bowl. Peel and finely chop the two cloves of garlic and place in bowl with vegetables. Remove stems from basil leaves and chop basil. Add to the bowl of vegetables and mix. Sprinkle red wine vinegar over the chopped vegetables. Drizzle extra virgin olive oil. Mix thoroughly. Generally, use 1 part vinegar to 2 parts oil. Taste and adjust vinegar and oil. The amount of cucumbers, pomegranate seeds and garbanzo beans can be adjusted to your taste.